Flip up iron sights are a highly functional AR15 accessory for use with various optics. This durable, all steel AR15 Front Sight attaches to any Weaver or Picatinny rail to give you a Back-Up Iron Sight (BUIS). The sight folds out of the sight line with the push of a button and flips and locks in the deployed position with ease. Once placed in the up position, the AR or M4 Carbine Sight cannot be folded down without depressing the spring assisted detent release button located on the left side of the sight base. This totally eliminates the possibility of accidentally lowering the sight. Don't even consider an Iron Sight without this feature. This sight accepts all standard AR sight posts (included). The front sight post is adjustable for elevation. YHM makes two front sight flip models. The YHM-9584 is taller and is designed for placement on railed gasblocks which sit lower than flattops. 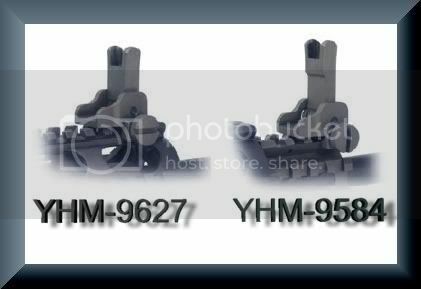 The sight designed to sit on the same plane rail, handguard or forearm as a standard rear sight is the YHM-9627. Green front night sight for M16/AR15. Installation tool included. Green lamp is warranted for 12 years from the date of manufacture. Trijicon 3 Dot night sights are designed and assembled with the optimum combination of strength and safety. The patented aluminum cylinder and sapphire lens construction cannot be equaled. The brightness obtained from the tritium content is focused through the sapphire lens to give the maximum possible illumination. Because the sight blades are machined from steel rather than cast, their strength is unsurpassed. Trijicon night sights are the brightest, strongest and safest. A-15/EM-16 & A2 Front Sight, Front Sight Only "The Low-light Advantage". Get an advanced low light sight for less than the cost of most standard BUIS!